In his public art installation at Brown University’s Engineering Research Center in Providence, Rhode Island, Spencer Finch embedded nine artworks into the very structure of the building. Drawing inspiration from a wide range of tiling—from the tessellations of Alhambra to a mislaid tile in the bathroom of his parent’s home—Finch plotted a new direction in the work, titled 'The Garden in The Brain'. Using common construction materials like fretted glass, ceramic tile, wood flooring, plywood panels, and concrete pavers, he fills the architecture with tessellation patterns that purposely range from striking to subtle. He envisions a moment when an engineering student, having lived with the work for a period of time, recognizes one of the subtle installations and the mathematics underlying it. The largest and most visible of Finch’s interventions is the grid of dyed and etched plywood panels installed in the hallway of the lower entrance. Visible from outside the building as well as within, the panels exhibit a sophisticated use of color that is characteristic of the artist’s work. 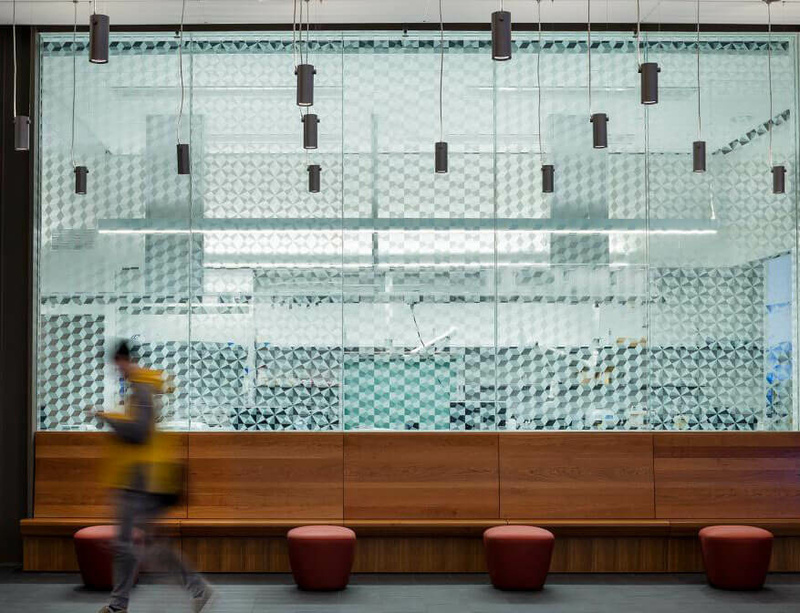 As designed by the architects of Kieran Timberlake, a glass wall separating the Hazeltine Commons from the Teaching Lab was fretted with a commercially manufactured dot pattern (to provide a degree of privacy). Finch’s more intricate, custom design repeats three patterns across the band of windows and creates a unique focal point within the Commons. Other tessellations include hand-made tiles in or outside of the restrooms, porcelain and wood flooring and concrete pavers outside the main entrance.